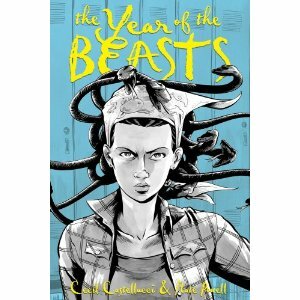 The Year of the Beasts by Cecil Castellucci & Nate Powell. Roaring Books Press, 2012. Currently available. Face Value: What a spectacular cover. The fierce young Medusa on the cover glares right at you from her perch on the shelf, practically insisting that you must pick up the book and read it. I love that the back cover shows a totally normal everyday scenario – a girl walking into a school – and contradicts the unusual image on the front. It made me even more eager to read it. The book looks like a typical novel because of its hardcover binding, but the cover illustration showcases its dual identity as a graphic novel. Does it break the slate? This is definitely a Slatebreaking book. Tessa and Lulu are sister characters that embody both the universal and the specific. Their relationship will feel familiar to any sister reading the book, yet the details of their situation are crafted in a way that makes it all feel fresh. As sisters, they have a remarkable bond – but that bond is challenged by the opportunity to blossom into popular young women desired by boys. The girls have to decide which is more important: their desire to be socially viable, or loyalty to a sister. Although Tessa made choices that were not Slatebreaking, she learned from the consequences and steeled herself against the jealousy and competition plague girl culture and female relationships. Who would we give it to? If this were not a library book and my sister didn’t live far away, I would send it to my sister immediately and ask her to read it. I think that readers who have sisters will get the most out of this book because that sibling relationship is so integral to the story. As for the appropriate age of reader, this book is hard to pin down – it fits somewhere in between the middle grade and young adult categories. The writing and storytelling is sophisticated, but the characters are young, in 8th grade and 10th grade. Review: Being a sister is an unusual job. Sometimes you have to stand up for your sister. Sometimes you avoid her. Sometimes you feel responsible for her. And sometimes, you despise her. As a sister myself, I found so much to connect with in this innovative book by Castellucci and Powell. Tessa and Lulu, two sisters very close in age, are the focal point of this story. The girls have often felt constrained by their parents’ rules, but this summer things are changing – this summer, the girls are allowed to go out on their own. As the older sister, Tessa is responsible for bringing Lulu along and making sure that she is included in everything. Although Lulu is a great person, she is naïve. Tessa cannot stand having Lulu tag along. It is unbearable. With Lulu following her around, how will she ever be able to grow up? Tessa’s world turns upside down as her friend group quickly accepts Lulu. Now Tessa’s friends want to hang out with Lulu instead of her. The boy that Tessa has been pining over for years is now Lulu’s boyfriend. Lulu blossoms socially and sexually while Tessa withdraws and steeps in jealousy. Tessa seeks solace through a romance with the local outcast, a boy named Jasper. As Lulu enjoys group dates and family dinners with her new boyfriend, Tessa feels that she must conceal all of her interactions with Jasper. She tells no one about their relationship and insists that their rendezvous remain secret. The sisters struggle with the changes in their relationship and grow quite distant. Lulu and Tessa find awkward coldness where there once was warmth and companionship. Then tragedy strikes. While swimming in dangerous current, both sisters are pulled under. Tessa survives while Lulu drowns. The shock of losing Lulu throws Tessa and her parents into a miserable period of mourning and depression. Tessa is overcome with guilt at the thought that Lulu might have survived if only she, Tessa, had been the one to drown. What makes this tragic story so unique is the format through which it is told. Cecil Castellucci wrote her chapters in prose, which alternate with graphic novel chapters illustrated by Nate Powell. Each takes a different approach to the narrative, and at first I wondered if they were telling the same story. 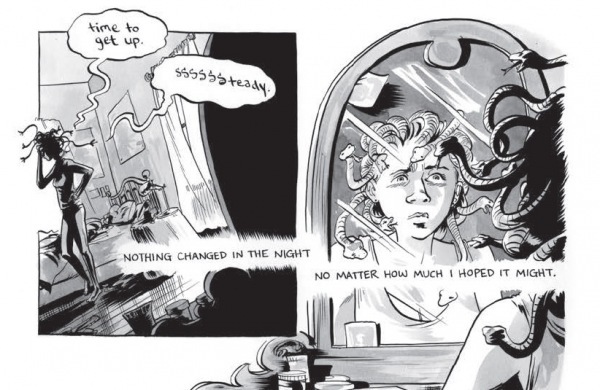 The narratives gradually interweave and it becomes clear that the graphic novel chapters are telling Tessa’s story in a stylized form, influenced by mythology. Tessa becomes a Medusa-inspired character. The bitterness and jealousy over her sister’s social rise has turned Tessa’s unruly hair into a head of snakes. Her angst has turned her into a beast, and she lacks the coping mechanisms necessary to change her plight. The mythological allegory in the graphic novel elements of the book is subtle and effective. Tessa feels alienated from everything after Lulu’s death, and her struggle to connect ends up merely turning people to stone. Powell’s illustrations are marvelous. They capture the intense grief that fills Tessa’s existence after she loses the most important person in her world. This book is an emotionally engrossing read and I would recommend that you keep a box of Kleenex nearby while reading. There is a particular passage at the end when Tessa resorts to self-injury that completely tore me up – I was a sobbing mess at that moment. Both Castellucci and Powell use their talents to convey the tumultuous emotions of Tessa’s summer – from the lusty romance in the woods to the hate and jealousy over her sister’s rise to popularity, it’s all at the forefront of the story. The reader goes on an emotional rollercoaster ride along with Tessa. I loved that both the prose and the illustrations equally communicated this emotional quality of the story. The author and illustrator have done an excellent job of balancing and proportioning this book so that the graphic novel and prose work together in harmony. It is an innovative approach to the novel that I hope to see more of in the YA publishing world. Tessa’s choices were, unfortunately, not so Slatebreaking. But she redeems herself at the end when she reflects on what she has done and realizes that sisterhood, love, and loyalty are worth more than the attention of a boy. What makes this a Slatebreaking book is that Tessa learns from her mistakes. She knows now that she has to control her inner demons – she must manage her snakes. Castellucci writes Tessa’s moment of discovery in the final chapter: “She would not ever be careless with precious things again.” The Year of the Beasts is beautiful story of sisterhood and growth. I see it as a cautionary tale that will provoke readers to assess their own relationships and identify those relationships that are damaging, as well as those relationships that must be cherished. This entry was posted in Graphic Novels, Middle Grade, Reviews, Young Adult and tagged Graphic Novel, Mythology, Romance, Sisters, Summer. Bookmark the permalink.